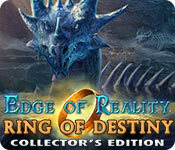 Edge of Reality: Ring of Destiny Collector's Edition is rated 3.8 out of 5 by 36. Rated 5 out of 5 by bishky from Beautiful - Intriguing - interactive - MUST HAVE This is a new type of game where you really have to work to figure out what is what. You must charge items, build things, find stuff and learn new techniques. This is one fun game. I really enjoyed it because it is so different from the usual run of the mill HOS games. It is absolutely beautifully drawn and the sound is great. Very interesting story line and it will keep your interest keep you busy. Give it a try and see for yourself. Other reviewers have given you much more detail than I can. All I can tell you is this is a great game. Rated 5 out of 5 by graceland9 from Amazing, Dark Take on Oz Ice, the cute golden Retriever you adopt, ends up being a lot more than a rescue pet! He guards the Ring of Destiny, and this artifact takes you into a new world. You have to fight for this kingdom, and along the way your ring gains new powers. You also find other magical items, which you have to charge through a Match-3 type game. There are plenty of interactive HOS, as well as FROG's and puzzles galore. I'm a fan of anything Oz-related, so when I saw the Tin Man was part of the story I was all, "Oh. I'm in." The art is amazing, there's an interactive map, and Custom Mode. Plus you get to work with Ice, your new buddy, to free the world. This could be one of the best stories I've ever seen in HOA. I could see a movie based on this fantasy! The action is exciting, and the puzzles, although easy, are gorgeous. This is a great game for middle school kids, especially if they're into the new Dorothy books. I know my daughter's going to love it, and the doggie companion will just seal the deal. So buying it. Rated 5 out of 5 by biscuitsmama from THE RING OF DESTINY WILL TAKE YOU ON A GREAT ADVENTURE Edge of Reality, Ring of Destiny is a game that is sure to delight those of us who are dog lovers. In the beginning cutscene we learn that there are powerful artifacts that when found have the ability to change history and destiny. This is where we first meet, Ice, a special dog who is sent on a “mission” to find the chosen one – someone who is worthy of wearing the Ring of Destiny. As the game begins you are on a trip to the local animal shelter, where you are immediately drawn to Ice who melts your heart, so off you go with your new pal to meet your destiny. A fantastic journey begins as you are drawn into an adventure to save Agora a world that is plagued by dark shadows that are controlled by the evil queen Glivera. With the help of Ice and many other new friends that you meet along the way, learn to use powerful tools and save Agora from the Shadow Queen. The game offers several modes of difficulty including a custom mode where you have various options to set up the game for how you like to play. The hand drawn graphics are for the most part quite good but sometimes they do seem a bit fuzzy. 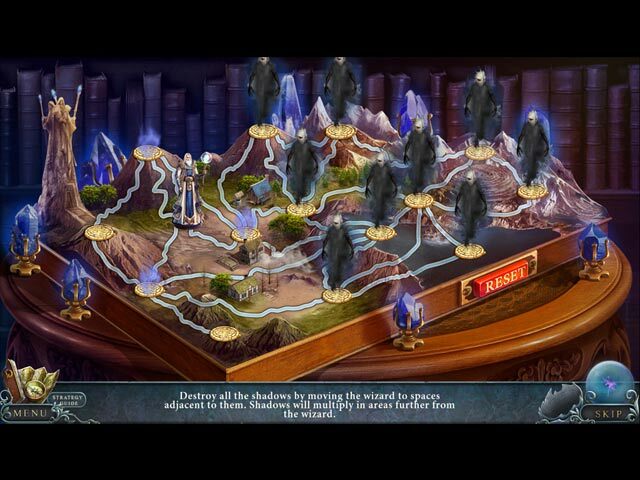 The voiceovers are excellent as are the music and special sound effects. Your tools include an interactive map as well as several special items that will be found during your journey. Early in the game you are tasked with learning how to use each tool so that you will be able to wield its power when needed. Of course, you also have Ice who will accompany you throughout the game but he isn’t one of those annoying pet helpers that you need to dress or feed before he will help you. The HOPS are well crafted, varied in style and quite enjoyable. There is interaction required to find some items in the HOPS and because of that many of the scenes contain mini-games that you will need to complete. The puzzles or mini-games seem may seem very easy for some gamers but that is not the case for everyone. I actually found some of the puzzles a bit more difficult but they are still fun and doable. The CE version of the game includes 46 collectible dragons to find, some of which seem difficult to spot. There are achievements to earn along with the other standard fluff that is normally found. That being said and although I don’t generally bother with wallpapers or screensavers, some of the artwork is amazing and you might want to add it to your collection; there is a dragon that I will definitely add to mine. When I played the demo of the game I wasn’t sure it thrilled me but as it progressed and I was sucked into the story it became a game I really enjoyed. Although it is the familiar storyline it is still what I consider to be an excellent game. Yes the graphics could have been a bit crisper but they still create the wonderful world of Agora that is full of interesting characters. I love dragons and that is another plus for me with Ring of Destiny. Even though I love this game, please try the demo to see if it is a game you will enjoy. Rated 5 out of 5 by pennmom36 from ONE RING......CAN CHANGE DESTINY Adopting a beautiful Golden Retriever (looks more like a yellow lab) at the Lost Hope animal shelter was meant to be, your destiny, and his! Turns out, Ice is no ordinary companion, Ice is from another world and he has been sent to find a human worthy of the Ring of Destiny. The Ring of Destiny is capable of moving mountains or changing history, the ring will transfer you to the world in need of help, which just so happens to be Agora. It is in Agora that you teem up with Aeron, the Chief Wizard and learn of the Shadow people who have nefarious plans to destroy the world. The Ring will need to be recharged after each use, in a Match 3 type game where you click and drag as many identical symbols possible until they have all been matched. Eventually your ring will have many capabilities, but for now, the ring can only ward off the evil Shadows. Each scene has at least 1 Hidden Dragon, as indicated by an icon tab on the left of the screen. There are also Achievemnets to earn and plus sign inventory items that require some type of interaction before using them such as a small puzzle. 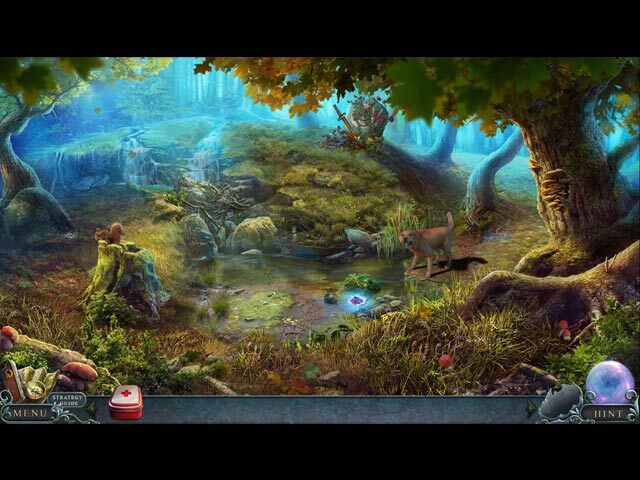 The Hidden Object Puzzles are just so-so, nothing really exciting, finding key words during a story, Interactive list finds, Fragment fins, Silhouetted Shape finds or following a recipe in the correct order. The Mini Games are actually creative, some super easy, some frustrating. The following are brief descriptions of some of the Mini Games you'll encounter during the demo: 1) Lead Ice to the shoreline avoiding monster arms, when the number on the spaces change to the number 1, the monster arm will appear there on the next move. 2) Restore the image by selecting different pearls to swap puzzle sections. 3) Using the clues, select runes in the correct order, followed by a Match 3 game. 4) Several puzzles where you must trace shapes without going outside the lines. 5) Help Ice find the correct path by selection matching prints in variations. 6) Destroy all of the shadows by moving the wizard to spaces adjacent to them, the shadows will multiply in areas further from the wizard. 7) Select the objects in the scene as shown on the scrolls to talk to the dragon. This Collector's Edition has 4 Music Soundtracks, 7 Wallpapers, 4 Screensavers, 6 Concept Art pictures, 12 replayable HO's, 16 replayable Mini Games, 11 Movies, 15 Achievements, 46 Hidden Dragons, a built in Strategy Guide and a Bonus Adventure, enjoy! Rated 4 out of 5 by Majestyx12 from Loved the Creatures Played the main game with bonus and liked it. Played on casual because that's how I like it. The HOPs are pretty with flowers, orange trees etc. So much fun. I was so happy to translate dragon language. Mixing the formula was fun because they made it easy, you just had to collect, it was relaxing. I was so surprised and glad to see a Pheasant. I like cute creatures. I like the mechanical creatures too. Hated some puzzles and just skip them and don't like tracing. Love the matching. Loved collecting the Dragons. Got tired of the same music playing so had to mute it. Rated 4 out of 5 by AforAllie from A fun game This was a fun game to play. The puzzles are a little different from what I had seen before and the level of challenge is good. Rated 4 out of 5 by Italia47 from Destiny's dog! Ice, Ice baby! The HOPS weren't that unusual but you do get to do a lot of interesting things in this game. The puzzles, mini-games were fun, challenging and tedious at times. Locating the objects were unusually fun. But I loved our little helper, Ice, the Golden Retriever. Ice is so much prettier and pleasant to look at instead of an elf with sharp teeth and horns! Sooner or later, you will get the opportunity to save that little canine. Cute dog! I loved helping Ice find the right path by matching the prints. Pretty cool! At first, I had ambivalent feelings about this game, fearing that it might be boring. It started out slow but then it began to pick up a bit and got pretty interesting. I played the CE game and after completing the bonus game, I got to go back and retrieve the rest of the dragons. There may be more than one dragon to find in any given area. There are other achievements to complete, too. The music was great; the voiceovers were very good. No big deal here, but one of the characters pronounced the word Agora as Angora with an 'n'. Stood out like a sore thumb with me for some reason. The artwork was very nice but not as sharp as I like the graphics to be, but still it was very good. Game flow was good and lots of things to do. I'm rating this game 4-1/2 stars. I definitely recommend this game! Good job, devs! Rated 4 out of 5 by rheashard2 from Fun I have been away from hidden these types of games for awhile. Updated computer and I was surprised. The graphics are excellent. The hidden objects are fun. Some of the mini quests are time worn. But the graphics makes these new again. Some of the graphic effects are superb. This is a fun game. Rated 4 out of 5 by hazelwize16 from I LOVE THE DRAGONS! been wanting to see something with dragons interacting with humans in a POSITIVE way ... not just SLAYING them ... would like to see more! ... for that alone i give 4 stars ... the HOs were ok, but disproportionate, something that i find a little annoying ... the mini games were very varied; that's a GOOD thing ... the technical continuity was a little bit slow, but no real glitches; i like things to move at a faster pace ... i don't mind having the dog companion, but i would LOVE to see the storyline be a little bit more adult ... it seemed like the developers were not completely decided on what age this should be targeting ... i am really GLAD to see a game going in this direction, and i hope to see some DRAGON SHIFTERS in the future and THAT interaction with humans! ... i did enjoy this one though! .... thank you! Rated 4 out of 5 by SuperOmmi from VERY COOL! ... mix of some aspects of my fav games I don't usually give a review for a game before I've completed the main game and the bonus chapter (which is why I rate so rarely, lol) but this one sucked me in and the demo ended with a cool bang. Other reviewers do an excellent job of giving all the details you'll need about the game. I'm just going to give you the bottom line. The gameplay is WAY COOL! It has aspects of Shrouded Tales (learning to wield magic and travel through portals), Dark Realms:Queen of Flames (Dynamite Dragon and a surprise demo ending), Lost Lands:The Four Horsemen (The wizard, warrior, gnome instead of dwarf, the tower of the wanderers, etc. ), and the evil villainess is reminiscent of DP Queen of Sands (just in the artwork- I didn't like QofS at all), and Dream of Ruins. Plus, this is made by the same folks who gave us the awesome League of Light. So if you're a fantasy game lover then you'll definitely dig this one! The story is solid, puzzles are fine but not very challenging, some repetition every time you use your magic (ala Shrouded Tales, etc. but I like the puzzle so I don't mind) I'm buying as soon as I finish typing this review! Rated 4 out of 5 by Granny_Gruff from Ice is the Best Thing About This Game! Ice, of course, is a reference to the dog helper you have in this game. He is sent to earth from another reality to bring the Ring of Destiny to a worthy owner and you are selected. You are transported to an alternate reality as soon as you put on the ring and find yourself in a world of trouble. Luckily the ring has abilities that you will slowly discover, starting with the ability to recharge magic objects. You will quickly find out that Ice has chosen you to be the savior of this world against an evil Shadow Queen. Good luck! Good Stuff: Lots of innovative story-integrated HOPs and mini-games, good artwork, dragon collectibles, and excellent VOs. Bad Stuff: You have several repetitious steps to go through to get things done, notably the Match-3 puzzle to activate the ring. I wish they had varied that a bit to go with the ring ability you were trying to activate each time. Overall it is a nice fantasy game, with a good story and good characterizations. There is nothing startling or amazing about it, but I do like the dog and the wizard. Try this one before buying to see if you agree. Rated 4 out of 5 by Torpedo1 from Ice and I on the Run This game had a lot to do but a lot of repetitiousness. More so then other games. They all have a certain amount of repetitiveness. The Cut scenes were many and Characters were grand. Very well done and made it worth sticking out the whole demo. This game had very good critter action and the puzzles were good it was just too many of them over and over again in just them demo. Lots to do, collect dragons, nice jump map, learn to fly, learn a new language, and dodge the local guards. lol I would still buy it just for the story part of it. The earning new physical features was great. Want to see more of what and where that gets the character. Game had a pretty nice beginning and loved the first meeting with Aron (sp) and all the shooting stars while listening to his explanation of things. Rated 4 out of 5 by sunnyglow from A GAME WHICH HAS THE “WOW” FACTOR – (BOW-WOW THAT IS) 7 CHAPTERS PLUS A BONUS CHAPTER OVERVIEW: In this whimsical, magical game you have been chosen as the “human” worthy of wearing the Ring of Destiny to help a troubled kingdom in this low 4-star game. This game is a dog lover’s delight. Although there is no “wow” factor in this game, it does have the “bow-wow” factor of a helper dog. It is a delightful family game which should appeal to children and adults alike. Although not the typical “helper” we see in casual games, (he is not sitting in your inventory nor at the side of the inventory bar), a Golden Labrador Retriever accompanies you throughout the game and helps you in your battle against the evil shadows. Being a “cat person,” this game does not appeal to me. The constant barking of the dog throughout the demo got on my nerves. I also am not impressed with the game script which, I feel, is somewhat confusing. The graphics are decent (although somewhat blurry) in portraying the fairy tale kingdom and its denizens. There is a mishmash of several magical creatures from many sources including the Tin Man (Wizard of Oz), leprechauns, dragons, wizards, angels all living together in this “diverse” kingdom. Even with all the numerous activities in this game, I found the pace very slow. STORY: Entering an animal shelter, you have been found and “adopted” by Ice, a Golden Labrador Retriever. As the “chosen one,” you receive an artifact, a ring, from this dog. The ring has been bequeathed to you to help the kingdom of Agora against the Shadows of the Labyrinth ruled by its evil queen, Glivera. You will be transported to a kingdom full of magical creatures and artifacts. Learn all the powers of the ring to stop the shadows from invading a kingdom. With your dog Ice at your side, you both will battle to restore the kingdom of Agora. MINI-PUZZLES: There are more puzzles than HOP scenes; although some of the puzzles could be considered a variation of a HOP scene. All are relatively easy. Even those which “increase in difficulty” are still within the realm of the “50 shades of easy.” As you continue in the game you will play a variety of puzzles to enable you to use the ring's various powers. In the demo, you play a variation of a Match 3 game whenever you need to inject magic energy into an object. You also play a mathematical puzzle to give you wings. There are two multiple-step puzzles in the demo. There is an excellent variety of puzzles, including jigsaw puzzles, maze puzzles, assembly puzzles, sequence puzzles, tracing puzzles, matching puzzles, and a mathematical puzzle. HOP SCENES: Actually, for this type of game, I am surprised there are not more HOP scenes. In the demo they include a FROG scene, lists of items, matching, and sentences with items listed in BOLD letters. LEVELS: Casual, Advanced, Expert, Custom Hints 10 to 180 seconds Skips 10 to 320 seconds EXTRAS: A Map is given to you at the beginning of the game 15 Achievements with 3 sections for each achievement totaling 45 A ring which has 5 abilities which will be used in the game Collect 46 dragons Strategy Guide Replay Mini-games and HOP scenes Wallpaper, Music, Screensavers, Artwork, Movies HERE ARE THE DETAILS (SPOILERS) FOR THOSE WANT MORE INFORMATION ON THE HOP SCENES AND MINI-PUZZLES IN THE DEMO HOP SCENES: A. FROG to create an inventory item B. List of items to locate C. Matching. Talk to a dragon by locating symbols in the scene to translate his speech. D. Multiple step. (1) Locate parts of a recipe to create a potion. (2) Locate items listed in BOLD letters. PUZZLES: The following puzzles are connected to the ring’s magic: A. Match-3 game. One of the games you play to use the ring’s magic. This one is used to infuse magic into objects. Connect 3 or more items next to each other either in a straight line or diagonally. Remove all the elements to charge the ring. INCREASES IN DIFFICULTY but all the games from the demo are well within the easy range. B. Mathematical puzzle. The second of five puzzles you play to use the ring’s magic. Create a path between numbers in numerical order. EASY The following are other puzzles within the game in sequence: C. Maze puzzle. Lead Ice the Dog to safety by landing on the correct numbered squares, avoiding the number one. EASY D. Assembly puzzle. Recreate a picture by moving slats on a tube. EASY E. Sequence puzzle. Using a code, press symbols in correct order on a medallion. EASY F. Tracing puzzle. Trace a symbol to defeat a shadow. 3X EASY AND BORING G. Matching. Match up animal paw prints to get out of a forest. 3 X EASY Supposedly the scenes increase in difficulty; however, I found all of the levels easy. . H. Storybook multiple-step puzzle. (1) Jigsaw puzzle. Restore a page in a book. (2) Matching. Match up pictures. (3) Locate items and replace them into the correct location ALL ARE EASY I. Variation of a Chess puzzle. Battle shadows with wizard fire. Eliminate shadows by landing on a token which takes out all shadows which are connected with it. EASY J. Multiple step. (1) Jigsaw puzzle. Recreate a stained glass window. (2) Sequence puzzle. Choose symbols in correct order. BOTH ARE EASY K. Manual dexterity puzzle. Move a glove through a maze without touching the sides to get a magical egg. EASY L. Assembly. After receiving an image of an artifact, create the image by combining several segments together. EASY M. Matching puzzle. Match up symbols as given to you in a code EASY N. Sequence puzzle. Move rings in proper sequence to remove bars. EASY . Rated 3 out of 5 by Darklldo from So-so The destinations were pleasant and enjoyable, the voice overs were good, the story was fine, except our dog Ice didn't get much of a look in despite being her guide. What I did find irritating was the lack of directions when it came to solving various games. I found myself saying "What on earth...?" many, many times. Too often it was not clear how the game was to be played and it was also hard to figure it out. Consequently, there were a number of games I skipped simply because I didn't have a clue what they were talking about. Other than that it was okay. Rated 3 out of 5 by nextgengranny from Ice Is Maybe Not The Only Dog Here My initial response to this game was quite negative, as it isn't state-of-the-art for 2016 in terms of gameplay, particularly the "interactive" HO scenes (remove a cloth from a cage to find an owl...? okay...). The collectible dragons were also a let-down, as I love a good dragon, & these turned out to be snout-nosed "dragonlings" (also, unless I missed something, there's no way to tell, as you go, if you've missed any, as the game doesn't track the cumulative # found). There are a few good mini-games, & while it's not great, it isn't horrible...thus, I gave it an actual rating of 2.5. This seems more like a release from a few years back than something new. I won't go so far as to not recommend it, but I do recommend that if you get it, you get it for cheap. Rated 3 out of 5 by Antig from Child-Oriented Game Can Amuse This gorgeous game full of dragons, crystals and runes can be amusing but will never let you forget it is oriented for children. Mildly annoying are the cutesy, semi-transparent dragons to find in each scene, dull and not very challenging mini games and endless runes to match up in the final battle scenes when you are looking for thrills instead. I should have read more reviews. The length was good, the storyline fun but it was mildly disappointing overall. Rated 3 out of 5 by LunaNik from I'm on the fence with this one, neither over- nor under-, just whelmed. Edge of Reality: Ring of Destiny CE Review based on completed demo PROLOGUE... Ring of Destiny hangs on an interesting but somewhat convoluted storyline. There were too many different kinds of magical artifacts. I think things would have been much clearer if the crystals were like magical batteries…charge them and let them imbue other things, like the guard’s spear in the beginning. It would have been more intuitive that way. “Ooh…there’s a crystal I can charge. Then when I see an object with a crystal setting, I’ll recognize it as a magical object.” Know what I mean? ONCE UPON A TIME... When you adopted a beautiful Golden Retriever named Ice, the last thing you expected was that he was a messenger from another world. Ice chose you to wear the Ring of Destiny, a magical artifact with numerous powers. Before you even have time to get used to the idea, you’re whisked off to the world of Agora where the dark creatures of its prison labyrinth are close to breaking free and wreaking havoc on the world. You have very little time to learn how to use the Ring and its powers. The fate of Agora is, quite literally, in your hands. PLAY THE GAME... Travel around Agora finding needed items for your quest, fixing broken things, and assembling incomplete objects. The denizens of Agora may help or hinder you, but doing them favors might get them on your side. HO scenes include interactive silhouette, interactive list, find key words from a narrative, correctly find ingredients in a recipe based on the clues, and FROG. Mini-games were all relatively easy and included: • a repeating test of dexterity involving using the mouse to drag a token along the lines of a rune • a swap pieces jigsaw where a bit of strategy was required, as only certain spots could be swapped • navigate through the dark forest by helping Ice sniff out the correct path, matching footprints in three levels of increasing difficulty • translate a dragon’s speech by finding relevant objects in the scene • a repeating match-3+ to charge magical objects • destroy the shadow figures by moving the wizard to spaces adjacent to them • guide Ice through a monster-infested swamp by moving him through a grid of numbered squares where the numbers predict when the monsters will appear SIGHTSEEING... The graphics fit perfectly with the fantasy theme with charmingly hand-painted landscapes, stark and monotone villains, adorable fairyland creatures, and your loyal and handsome pup Ice. Animation is not completely realistic, but done well nonetheless. SOUNDBOARD... I found the music somewhat monotonous, too dramatic. I would have preferred ambient music and more environmental sounds. Voiceovers were professional. TOOLBOX... Interactive jump map that indicates areas with available tasks. Lockable inventory panel with plus items. And the Ring, of course, which gives you quite a few magical powers (as you learn them). OH BOTHER! No technical difficulties or bothersome issues with Mac OS 10.11.3. OOH! PIECE OF CANDY... Discover the Queen of Shadow’s past in the bonus chapter. Replay HO scenes and mini-games. Collect hidden dragons in each scene. Earn performance achievements. Other candy includes the SG and the developer’s portfolio of music, wallpapers, screensavers, movies, and concept art. EPILOGUE... This is one of those middle-of-the-road games that, after the demo, I’m not sure whether I like. On the one hand, there were some original HO presentations and mini-games. And the storyline has promise. On the other hand, the game was really easy, and the story elements were a bit confusing. So, my recommendation is to try the demo. Rated 2 out of 5 by Meganthedog from Not the best I started playing this one evening late on and went back to it this afternoon. I had forgotten what the storyline was, who I was, what my aim was; all I knew was that there was a dragon involved. This isn't to say my memory is going, it's just that so little stands out about this game that it is easily forgettable. Boring repetitive HOs and games don't help much either. I did like the dragon and that's the only reason it gets two stars and not one. Rated 2 out of 5 by watson13 from Waste of time, money and maybe eyesight It is really becoming harder and harder to choose the game you will enjoy playing. I have played half the demo and bought it. Big mistake: too much talking, too many light effects, mini games I have already played in other games. They make no rhyme or reason and have nothing to do with the game story. I wish I could have swapped this CE game for another CE because I am not going to play it any more. Maybe I should have played it longer but that was too much for me. Rated 2 out of 5 by sssalpha1358 from Don't waste your time. I was so under whelmed by this game that I didn't even finish the free trial! I downloaded it because it had such high reviews but was very disappointed. I thought the graphics were poor, the hidden objects and clues were way to easy (maybe on a more difficult setting they are less obvious but honestly I wasn't even motivated to try), and the story line in unengaging and corny. Rated 1 out of 5 by Chrisppp from If you don't like repetitious music don't buy this game. I'm mostly playing it with the sound off because of the constantly repeated piano riff. I'm not enjoying the game all that much either. It's not intuitive and I've been into the strategy guide more than I have since I first started playing HOPs years ago. The graphics are muddy and some of the things you have to find are so small they're almost invisible. Not a fun game IMNSHO. Rated 1 out of 5 by chickenjools from Was bored witless I bought this game on the strength of the reviews and I really wish I hadn't. I hated it! The music drove me mad so I turned it off, the graphics were poor and the storyline was blah! I finished it because I'd bought it and hoped it would improve but it didn't. I can't even be bothered to play the bonus game. Total waste of money. Wish I could get a refund. Rated 1 out of 5 by swissmisscrys from Worst game ever! 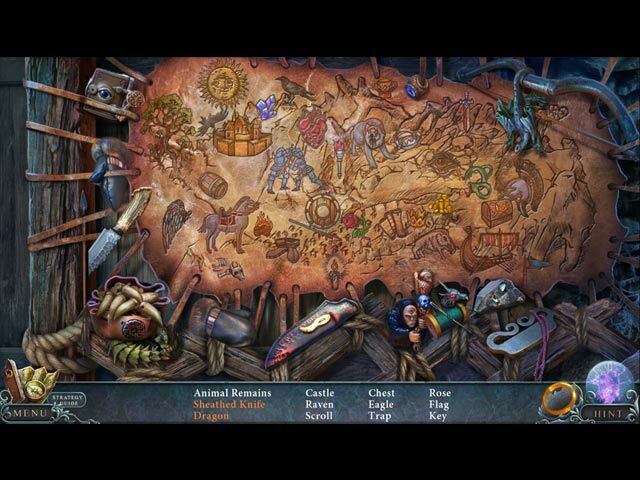 Ok, so I play a lot of "hidden object" games. Some are more difficult that others. This one was difficult but only because the the name of the objects were off, some moves moves made no sense, and the story was just blah! I wish that I had tried this before buying. The only reason I finished it was because I purchased it and secretly hoped it would just get better. I recommend trying it before buying!!! !